I made capes for my 2 soon-to-be GS for Christmas. Sounds simple, doesn’t it? Well, it actually was fairly simple. Let me tell you how. First, I used a pattern — Simplicity 5927. I wanted a full cape that could be pulled around the body completely. I used the plain view without a stand-up collar. 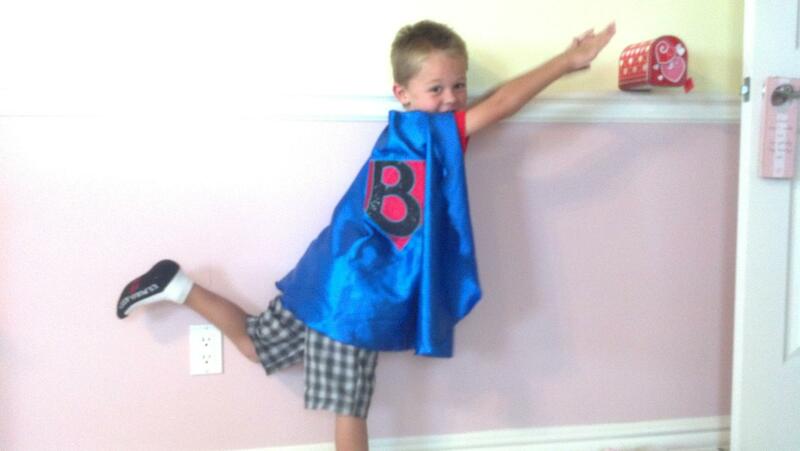 The pattern comes in several sizes, so the cape for the 6yo is 4-5″ longer than the cape for the 3yo. I chose bright blue and purple because they seemed very “royal” to me and because I had the fabric in my stash. No purchase required! 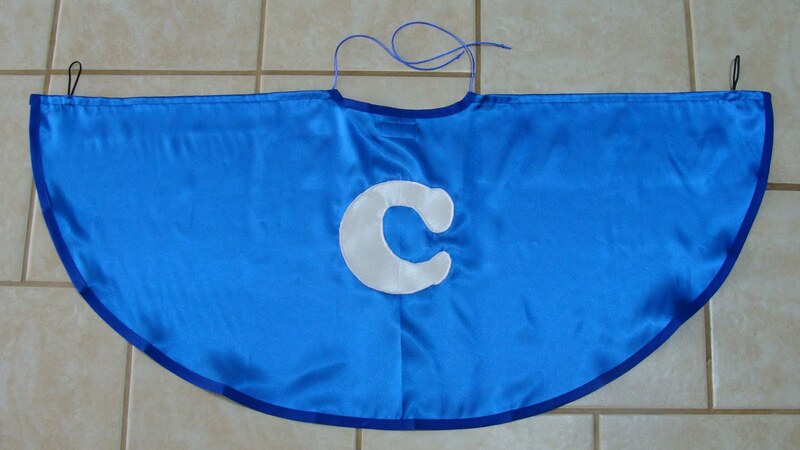 After cutting out the capes, I applied large initials to each one. I just used fusible web and then zigzagged the edges. Pretty simple! Because the pattern called for felt, there was no allowance for seams. So I applied bias tape along all the raw edges. Around the neck edge, I just extended the bias edging out for ties on each side and put a knot at each end. These capes were so easy, I made then both in one day. But here is where the real fun started. Capes, I have found, are magic! They may look simple, may be easy to make, and may be a cinch to use, but trust me, they are magic! Something truly mystical happened when those 2 little boys put those capes on for the first time Christmas morning. To begin with, the 3yo could fly! Then the 6yo became invisible! Then we had visits from Superman, Batman, Count Dracula and Captain Hook. In the following weeks, those capes have covered Knights of the Roundtable, emerging butterflies, magicians, kings, super-heroes of every sort and sometimes just sleepy little boys. 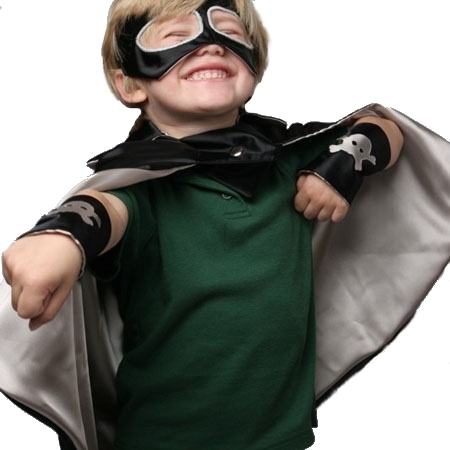 Putting on a cape transports a child to another world — one of imagination, play, and creativity. Nothing is impossible and all thoughts can become real with this magical piece of fabric wrapped around a small body. 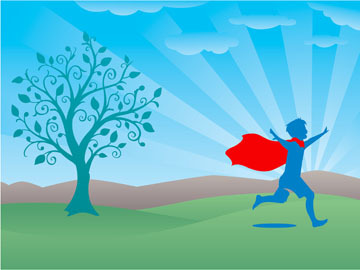 With a cape on, a small person is big, a weak person is strong, and a frightened person is safe. It’s empowering, comforting and stimulating all at the same time. I’m not sure what happened to the capes between the sewing machine and the shoulders of those boys, but they somehow became saturated with fairy dust. They became the most wondrous things and had the most profound effect I have ever seen. Those 2 capes cost me nothing but a few hours of my time to make but have given me more joy than I can say. 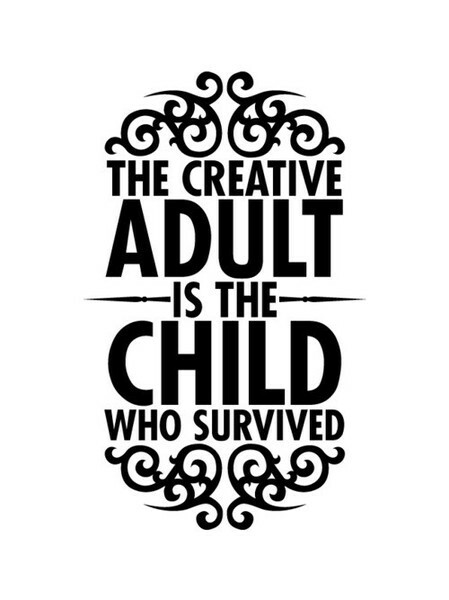 How great is it to be able to wrap up true magic and give it to your grandchildren? And then be given the utter privilege of watching magic work its wonders? There’s nothing better, my Sweeties. Nothing better.